He was born about 1220, the second son of Yaroslav II Vsyevolodovich, grand prince of Vladimir and Yaroslav's second wife, Rostislava- Feodosia Mstislavna, princess of Novgorod, whose mother was Anna, daughter of the famous Polovtsi Khan Khotyan and whose father was MstislavMstislavich Udaloi. 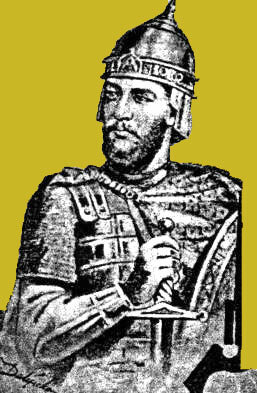 Aleksandr was prince of Novgorod in about 1228 with his brother Fedor; prince alone from 1236 to 1240 and again 1241 to 1252; grand prince of Vladimir from 1252 to 1263. Aleksandr married around 1238-9 to Aleksandra Bryachislavna, princess of Polotsk. His sons were Vasilii, prince of Novgorod; Dmitrii, grand prince of Vladimir; Andrei, appanage prince of Gorodets; Daniil, appanage prince of Moscow; and his daughter was Yevdokia who married about 1262 with Konstantin Rostislavich, prince of Smolensk. Her sons were Yurii and Fedor. The family preceeding Alexandr is shown on this chart. On this chart Alexander is shown with his descendents.